Welcome to Show and Tell Friday! About this time every year I get the knitting bug! I pulled out the scarf I've been working on for the last three years to knit and realized that the moths had found the wool. I didn't even notice that they had eaten holes in it until I worked on it for a couple hours! It was so bad I just threw it away and started all over with a non-wool yarn. It was hard to throw it away because it was almost finished! This time I think I will finish it this season! I may even start another one once this is finished since this one is for my daughter and I would like one for myself! 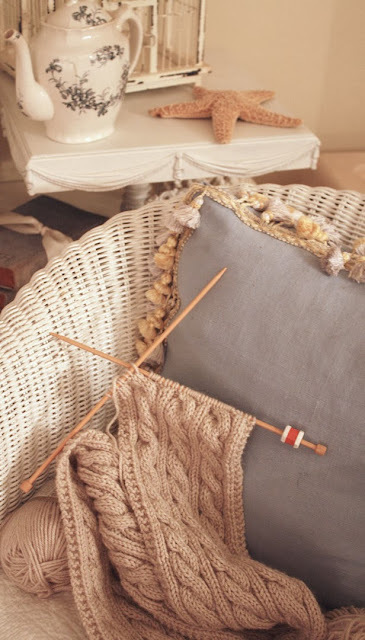 If you know how to knit the pattern is very easy. It can be downloaded free here: Ravelry Irish Hiking Scarf Pattern. I would like to say thank you for to all of you that clicked on the HP link to help me win the contest! The contest ends Sunday and I am in the lead thanks to all of you! I really need a new computer so I'm so thrilled that so many of you helped me out! Love the scarf! It looks so comfy. Thanks for hosting my dear! That scarf is really pretty Cindy. The cable stitch is my favorite. I'm going to tell my daughter about this pattern. She's the knitter in the family. Thanks for hosting, good luck with the contest and have a great weekend. Sure hope you win. Lovely scarf. Thanks for hosting and have a great week. Hello Cindy, the scarf looks lovely - I'm going to save the pattern to give it a try! I have tried your pumpkin muffins -twice - my family loves them! I do appreciate you hosting and hope you have a blessed weekend! Thanks for hosting Cindy. I've been doing garden clean up and prep for winter. Have a great week. That scarf pattern is beautiful Cindy. 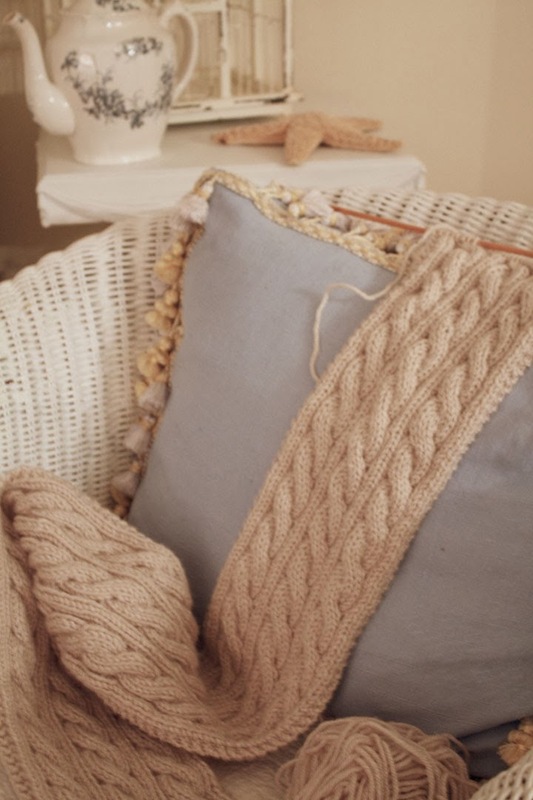 Thanks so much for sharing the free pattern download! Thanks also for another lovely week of partying. Too bad about your scarf, but on to bigger and better things! Good luck with the contest and thanks for hosting! Oh a truly spooktacular scarf! Thank you for hosting. Thanks for hosting. I love the style of your blog. It must be really popular! what a fantastic link up. thanks so much for hosting. your talent is simply amazing! Thanks so much for hosting every week, love the scraf. Love the scarf and the knit..Would love to have an afghan like that with maybe a little cable thrown in..
Cindy,what a shame to have to throw such a lovely scarf out. You made it so beautifully too,all that work for nothing. Good luck next time. I must admit I made a baby shawl and packed it away safely and the silver fish ate all around the edge of it :( not a nice feeling to find it like that,especially knowing that those little creatures are lurking in our cupboards. No wonder our grandparents used the toxic napthalene flakes,which I would never use and can't stand the smell. I've heard that borax sprinkled around deters them though. Hi Cindy, this is my first time to link -up at Show & Tell Friday... what a great Party, Thanks for hosting..
Cindy, thanks for the party! This is the first time we have linked to your party, what a wonderful way to share and also find so many great blogs! We are also your newest followers! Thanks so much for hosting - hope you have a great weekend. Thank you for hosting Cindy. Good luck on the contest Sunday! I never learned to knit so I am very impressed with your lovely scarf. Have a great weekend! Oh no! Moths drive me crazy having destroyed more than one cashmere sweater. Your knitting is beautiful, I've still never learned how to do a cable stitch.Thanks for hosting a great party!
" How to become a hacker Learn hacking step by step"
" Windows 8 Download Very Fast in few minutes"
" Mobilink Hacking Latest tips and tricks cheats codes "
" Samsung Mobiles Latest Tips and tricks Cheats"
" Grand Theft Auto Vice City Free Download full Game & Cheats Very Fast Download in Few Minutes"